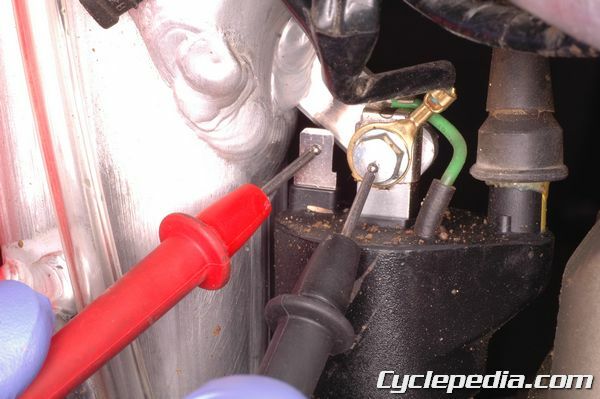 At Cyclepedia.com we provide technical support to our members using our online manuals to service and repair vehicles. On a regular basis we get a service ticket from a member saying, “I’ve replaced my ignition coil, ECM and/or some other expensive part and I still don’t have spark. What should I do?” This is frustrating for the member and our tech support team. For the member, they have needlessly spent money to replace expensive parts and aren’t any better off for it. 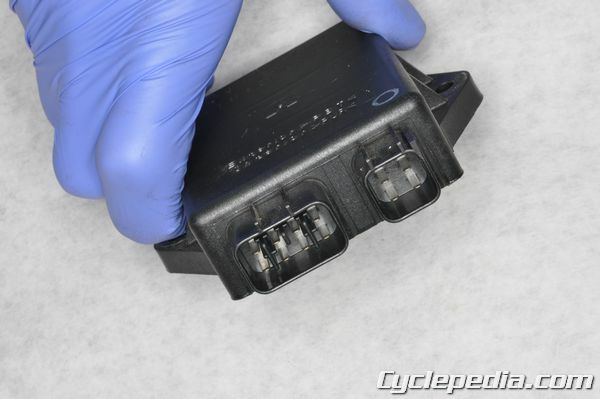 For the Cyclepedia crew, we wish we could have helped when the initial problem surfaced to avoid unnecessary blind part replacement. It is extremely rare for a no spark condition to be the result of a faulty coil or ECM. Users get fixated on these items and jump to the conclusion they must be responsible for their problem because these items are easy to see and replace. This is the opposite of the strategy needed to fix a no spark condition. When taking on a no spark condition one needs to be patient and have an open mind. Becoming fixated on specific components is a good way to not find the true problem. 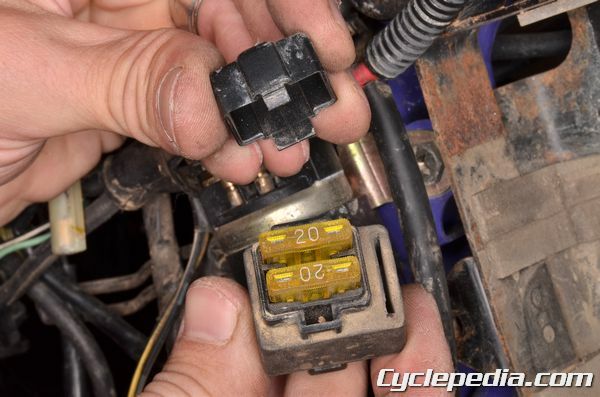 Its far more likely that there is a problem with a wire, connector, ground, or switch than an actual ignition system component, but only assume the fault could be anywhere so don’t focus on a single item until testing indicates that item may be faulty. Start at the beginning and don’t jump ahead. If the vehicle is equipped with a battery make sure it is fully charged. An under charged battery can result is slow cranking speed that will not be optimum for the ignition system. 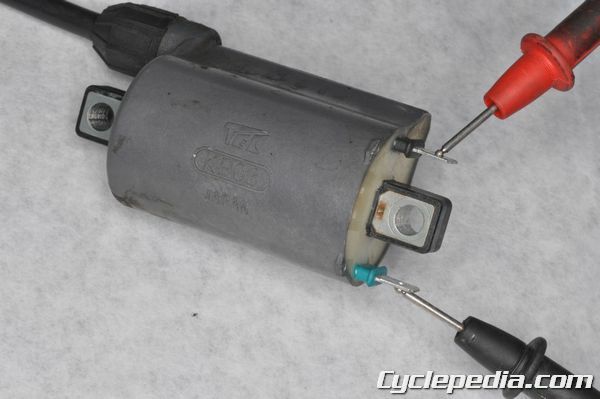 Check the condition of the main and ignition fuses. Make sure the switches in the ignition system are connected and are in the correct position for ignition system operation. When checking for spark, fit a new spark plug into the plug cap and ground this new plug to the engine. Make sure there isn’t any water in the spark plug cap. Leave the old plug in the head for proper compression. Do not touch the spark plug or wire while cranking or running the engine as this can result in a severe shock. Crank the engine and observe the spark plug for spark. If there is spark examine and replace the old spark plug as necessary. 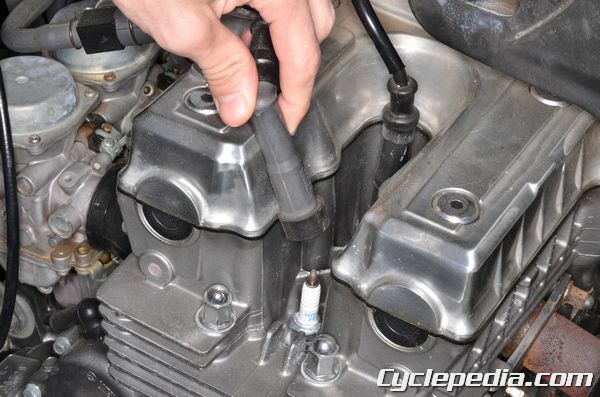 If the engine is a multi cylinder make sure the spark plug caps and wires are installed to the correct cylinders – check the ignition timing if necessary. It is time to start troubleshooting and testing the ignition system now that the no spark condition has been confirmed. It is important to check the connectors and wiring as your work through the system. There may be a loose connector or faulty connector wiring that is disrupting the circuit. Check for corrosion and poor fitment between male and female wiring terminals. Check grounds for solid connections. Use the wiring diagrams to aid in wiring inspection. Any ground wire should have continuity to a ground. Non-ground wires shouldn’t have continuity with a ground, but they should have continuity with themselves at other places in the wiring harness. For example a blue/white signal wire from the pickup coil needs to have continuity between its terminal where it connects to the harness from the coil, and its terminal where the harness connects to the ECM. If the wire doesn’t have continuity on both sides of the harness there is a open circuit and the ignition system will act as if the pickup coil is faulty though it is actually a wiring problem. Part 2 of dealing with no spark ignition system problems will go further into detail on component inspection. Faulty components are more rare than a wiring problem or other outlying issue, but they do happen and the manufactures provide testing instructions. No spark issues are common, frustrating problems. Remember to be patient and inspect the full system not just the main components. Part 1 of ignition system no spark troubleshooting focused on the general electrical problems that often result in no spark conditions. Part 2 will go deeper into testing the specific components of the ignition system. Testing the components will require a multimeter for measuring voltage and ohms of resistance. 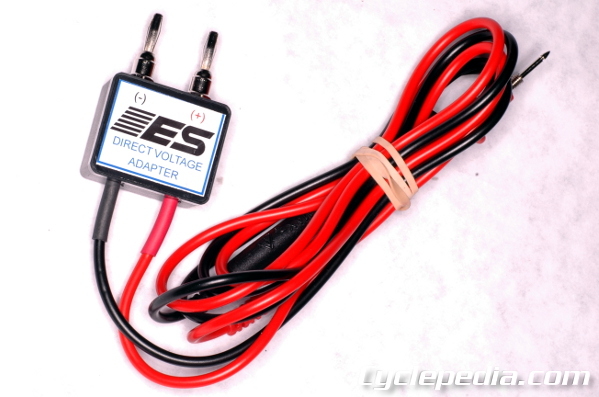 Also, a peak voltage adapter (PVA) will be needed for the multimeter to read pulse voltage where the voltage increases and decreases in a short period of time. 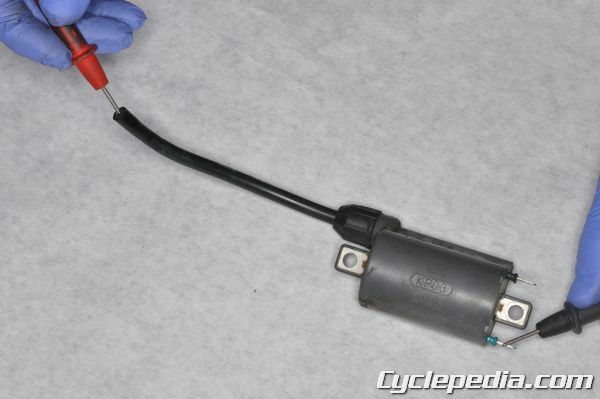 Place the ignition system in a condition similar to checking for spark when conducting peak voltage testing. There should be spark plugs installed in the cylinder head and known good plugs installed in the spark plug caps. The spark plugs in the caps should be grounded to the engine. All ignition circuit switches should be placed in run positions. The the connector being tested for peak voltage may need to be plugged in during the test. Use the kick starter or electric starter to turn the engine over and measure the peak voltage with the PVA and multimeter. If the peak voltage is out of specification test it at other locations if possible. 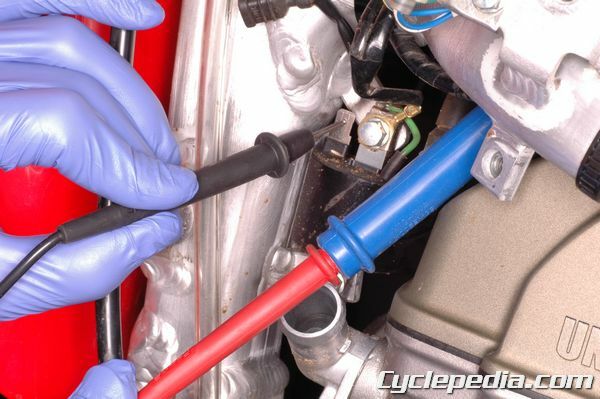 For example test the crank position sensor peak voltage at the crank position sensor connector and at the ECM connector. The peak voltage should exceed the minimum specification given in the service manual. 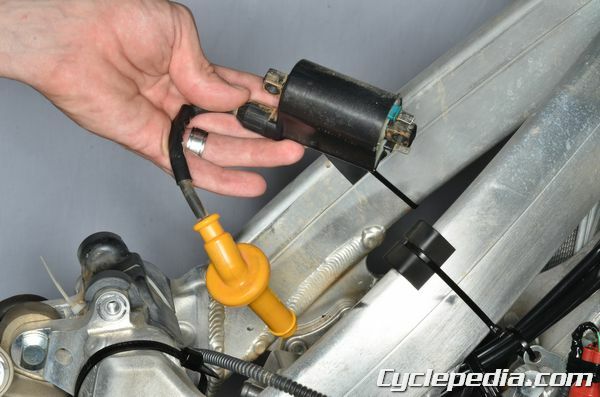 Inspect the ignition coil/s as indicated by the service manual. This may include peak voltage testing and/or resistance testing. Use resistance testing to inspect the ignition system components if peak voltage testing specifications are not available. Measure the primary resistance between the two terminals of the of the ignition primary coil. Measure the primary resistance between the terminal and a ground if the coil only has one terminal. 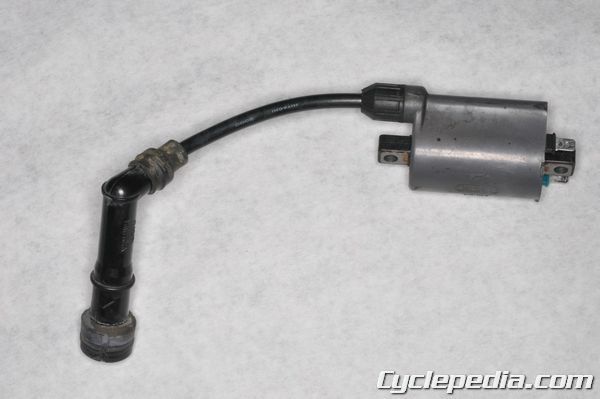 Check the secondary coil resistance between the primary ignition coil terminal and the spark plug cap. 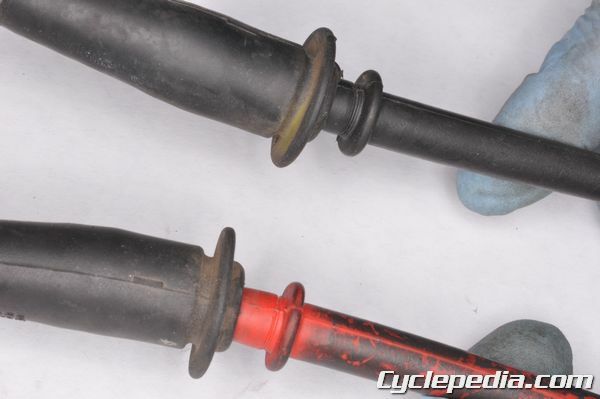 Check the secondary resistance between the two spark plug caps if the ignition coil has two spark plug wires. Also check the resistance with the caps removed from the wires if specified. 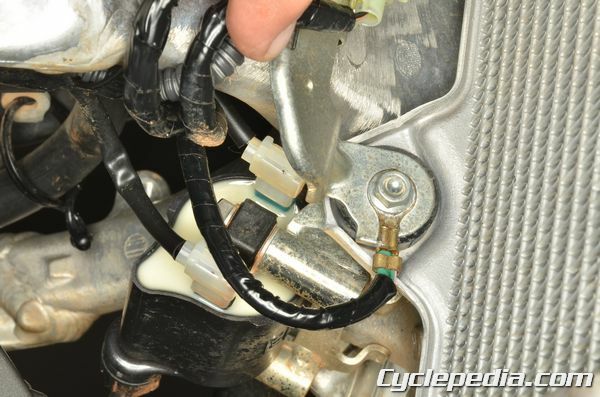 Replace the ignition coil, spark plug wire, or caps as necessary if the resistance is out of specification. Inspect the crank position sensor, pickup coil, and/or exciter coil for resistance and peak voltage according to the service manual. If possible check this a multiple locations like at the coil connector and at the ECM connector. Not only do we need to know that the component is functioning correctly, but we need to know that the related wiring is intact. 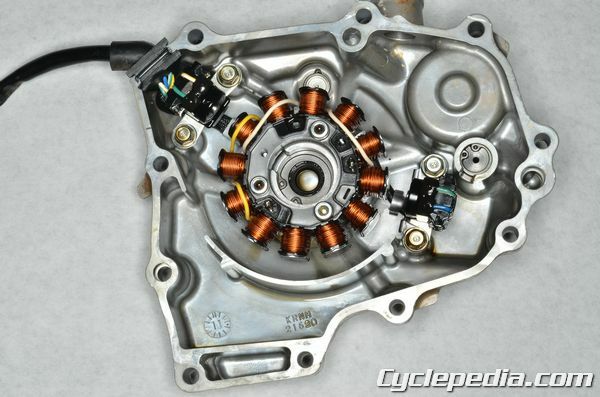 The crank position sensor and exciter coil often must be replaced with the stator as an assembly. Inspect the ignition system related switches for correct continuity according to the service manual or wiring diagram. 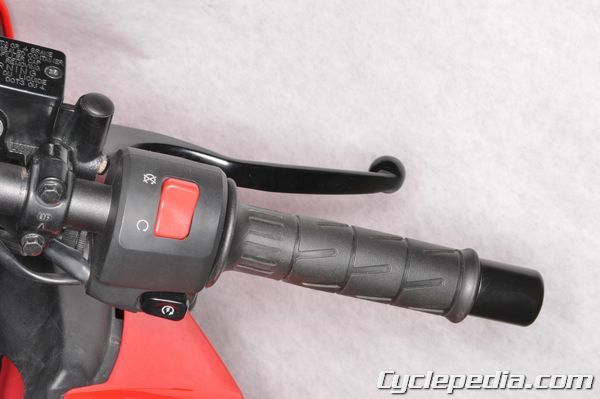 This usually includes the main (ignition) switch, engine stop switch, and side stand switch. Other switches involved may be gear position/neutral, reverse override, tip-over, and other ignition based safety switches. Replace any faulty switches or switch related wiring. In rare cases there are resistance tests for the ignition control module (ICM) or engine control unit (ECU). Most of the time the only way to determine an ICM/ECU is faulty is to rule out all other options. Unfortunately many people want to jump ahead and reach this conclusion before fully inspecting the entire system. It is far more likely that a bad connector or wire the is cause of the problem than the black box. 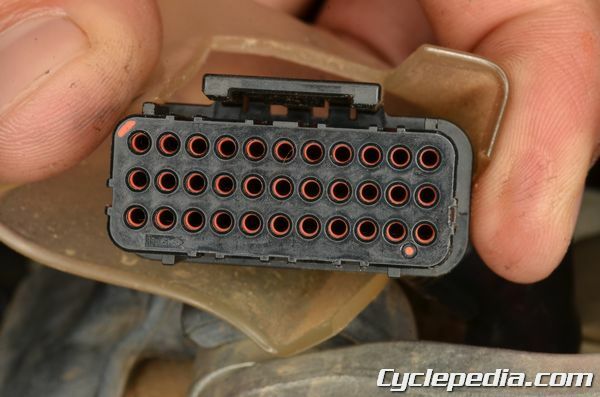 With that in mind do not even consider replacing an ICM/ECU unless you are 100% confident that all ignition system components, switches, wires and connectors are in perfect working order.